Cook's Notes: A festive start to your weekend with mini-chocolate cakes drizzled with Baileys Irish Cream Icing decorated with star sprinkles and paper umbrellas. Small flags would be another great alternative. Buttermilk makes the cakes moist and espresso powder deepens the chocolate flavor. Recipe makes 16 mini- cakes and was adapted from BHG Magazine. Another cake option is included at the end of this recipe. Let butter and eggs stand at room temperature for 30 minutes. Meanwhile, preheat oven to 350 degrees . Line muffin tin with cupcake paper liners. In a medium bowl, stir together flour, cocoa powder, baking soda, baking powder, espresso powder and salt. In a small bowl, combine granulated sugar and brown sugar. Set aside. In a large bowl, beat butter with an electric mixer on medium to high speed for 30 seconds. Gradually add sugar mixture, about 1/4 cup at a time, beating on medium speed about 3 minutes or until light and fluffy, scraping side of bowl occasionally. Add eggs in one at a time, beating well after each addition. Beat in vanilla. Alternately add flour mixture and buttermilk to butter mixture, beating on low speed after each addition just until combined. Beat on medium to high speed for 20 seconds more. Bake 16-18 minutes. Remove cakes from pan. Cool on a wire rack and remove paper liners from each cake. Place wax paper underneath the wire rack. Pour icing over each cake. If using sprinkles add at this time. Refrigerate 15 minutes for icing to set. Mix all ingredients together except milk. Add only as much milk needed to achieve the correct icing consistency. 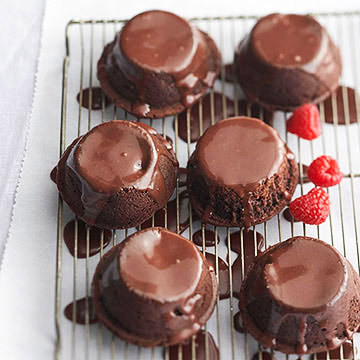 Use the same cake ingredients listed above but you will need a pint of raspberries for these mini-cakes. Follow same directions except at the end of recipe place a spoonful of batter in each cupcake liner. Add 2 raspberries in center of each cup. Spoon remaining batter over berries in each muffin cup. Bake 18 minutes or until a toothpick inserted near center comes out clean. Cool on a wire rack. Remove wrappers from cakes and add chocolate icing. In a medium heavy saucepan combine whipping cream and corn syrup. Cook and stir over medium-low heat just until mixture is simmering. Remove from heat. Stir in chocolate pieces and vanilla; whisk until chocolate is melted. Transfer to a large bowl. Cover and chill about 20 minutes or until icing reaches a thick, pourable consistency, stirring occasionally. Refrigerate 15 minutes for icing to set on mini cakes.